As of 5 AM this morning there is a Hurricane Warning for the Big Island of Hawaii and a Hurricane Watch for portions of Florida. Meanwhile Hurricane Gaston is a still a major Category 3 Hurricane in the open Atlantic and Tropical Depression 8 is pushing south and east of New England. I'll get to all the tropical mischief in a moment but first lets touch on the Southern New England forecast. In terms of our weather there will be a mix of sun and clouds today with temps in the mid 80's. Dew points will be in the mid 60's as well. The rip current risk will be moderate today for all Southern New England beaches as a 3-5 ft swell from TD 8 and Gaston impacts the shore. Rain pulls away by 2-3 PM leaving behind an air mass with max temps in the 70's and dew points in the 50's. A perfect early fall preview for Friday and perhaps Saturday before we have watch what TD 9 does. First lets go to Hawaii. Actually most people would want to avoid Hawaii as Hurricane Madeline heads toward the Big Island. She is weakening but is expected to pass close to South Point if not right over. Heavy rain, damaging winds and dangerous surf will accompany the storm. A Hurricane Warning is in effect for the Big Island with Tropical Storm warnings posted further west. Closer to home TD 9 is ready to become a named storm and head towards Florida. Given the available warmth in the Gulf and a more favorable upper level wind pattern this storm can intensify quickly. For that reason the NHC has issued a Hurricane Watch/Tropical Storm Warning. East of the center will see a dangerous storm surge while west of the center will see heavy flooding rains. The storm surge potential is heightened in this part of Florida thanks to the concave curvature of the coast. Now I'm sure attention is being paid to the 5 day part of the forecast and I see it and will evaluate this. For now the potential for a crappy Sunday/Monday at the Cape is real. Five years ago this morning power went out for many in Southern New England as Tropical Storm Irene moved up the east coast and into New England. 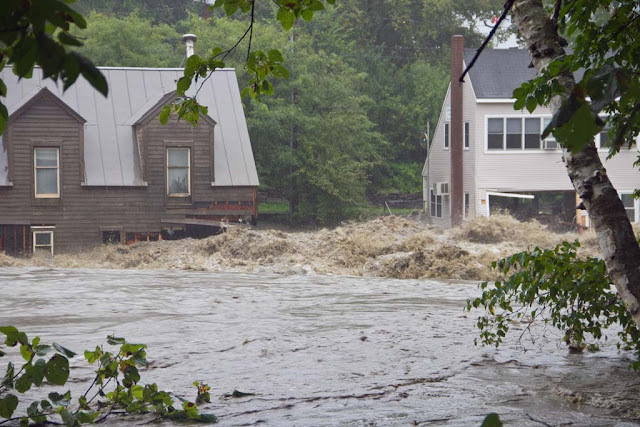 Irene brought devastating floods to Vermont and upstate New York as well as lots of wind damage to Southern New England. The power would not be restored for 4-5 days for many. Although Irene was a tropical storm its low central pressure and large wind field created widespread problems. For me it remains one of the most memorable storms I have ever covered for this blog. Irene shows that a tropical storm can be extremely disruptive to our lives. 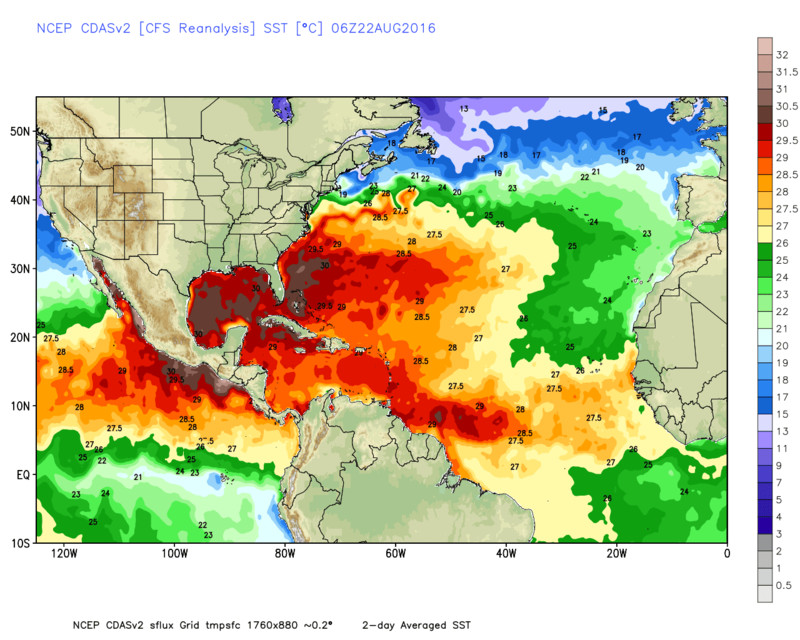 If you read my last blog you know the tropics are heating up. There was much speculation about a tropical wave potentially hitting Florida or the Gulf Coast. Even I said it reminded me of a certain storm from 11 years ago for South Florida. That was wrong. I used the name Katrina not for the New Orleans/Mississippi part of the storm but for the South Florida landfall in 2005 in which Tropical Storm Katrina strengthened right before landfall near Miami catching people off guard. That's the only point I was trying to make but I realize you can't use the K word when forecasting. It makes people uneasy. Well the storm never formed which was always a possibility. But we can't bury it yet- all signs point to something developing in 48-72 hours when the disturbance moves into the Eastern Gulf of Mexico. But it now appears a new tropical depression off the Carolina coast will get the truly horrid name of Hermine while the Gulf system would be named Ian. Gaston is a strong category 2 Hurricane making its way out to sea. 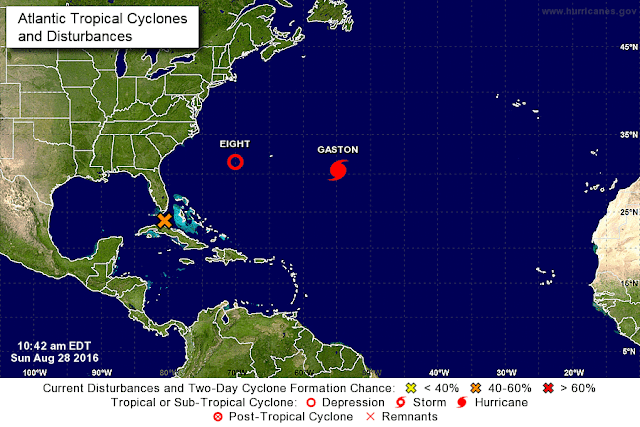 Tropical Depression Eight is forecast to move near NC before turning out. 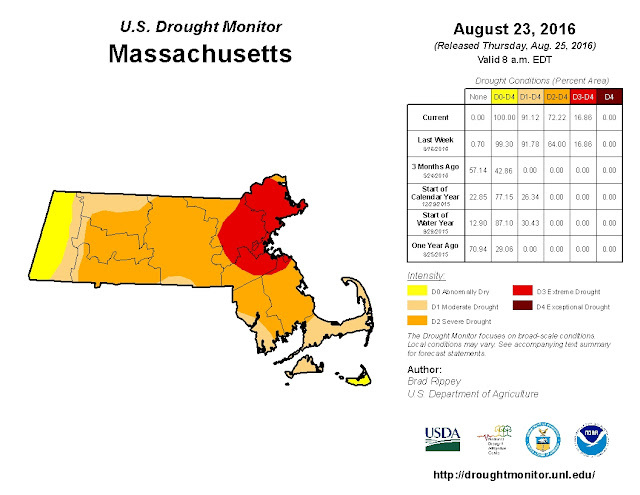 Hopefully we can get some rain from it in Southern New England but it doesn't look likely. Not much expected this week. Not good. Severe to extreme drought is in effect for over 70% of the commonwealth. 1) US Tornadoes takes a look at the "surprise" tornado outbreak from Wednesday. 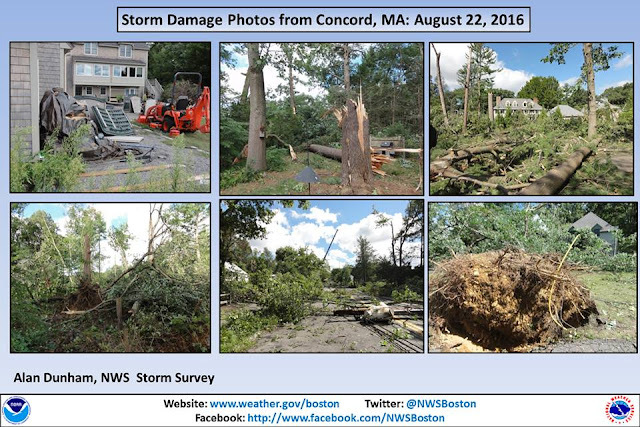 2) David Epstein of Boston.com takes a look at the overnight EF-1 tornado in Concord, MA. 3) USA Today wonders why people didn't pay more attention to the Louisiana floods. 4) Dr. Marshall Shepherd leads a round table on the tropical wave about to enter the GOM. 5) Accuweather discusses Typhoon Lionrock as it approaches Japan (best name in the tropical game). 6) The Weather Channel discusses Tropical Storm Madeline and its potential to impact Hawaii. 7) After the earthquake in Italy experts warn about keeping the mafia away from the rebuild. 8) On this years anniversary of Katrina others need help from New Orleans. I'll talk to you guys during the week! Its Wednesday and one of the last weekends of summer is rapidly approaching. Here is the latest for the next several days. After the general forecast I will discuss the Atlantic tropics. High pressure remained in control today for more warm and beautiful weather. Tomorrow the high is offshore and winds will increase out of the southwest ahead of a cold front. The good news is we stay dry during the daylight and evening hours Thursday. Max temps are 85-90 across Southern New England. Heading to the beach? Surf will be a bit higher tomorrow thanks to an increasing southwest wind. Moderate rip currents are likely for the beaches north of Boston. These surf conditions will expand to the south for Friday. Overnight Thursday into Friday the cold front sweeps through the region. 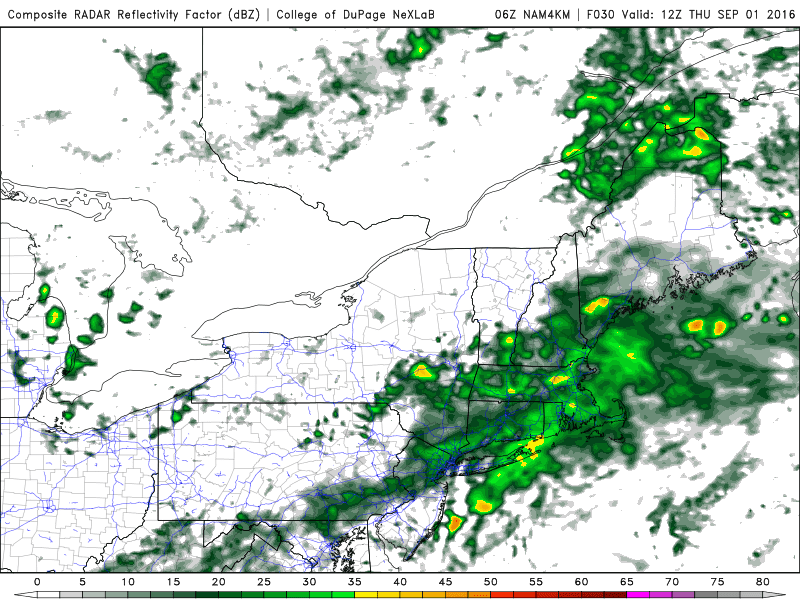 Isolated showers and thunderstorms will break out ahead of the front after midnight Thursday through Friday 3 PM. Its a good thing the front does clear by late afternoon as dew points will crank into the low 70's. I'm not expecting much in the way of rainfall from any of the storms. Tomorrow I will post my thoughts on timing. 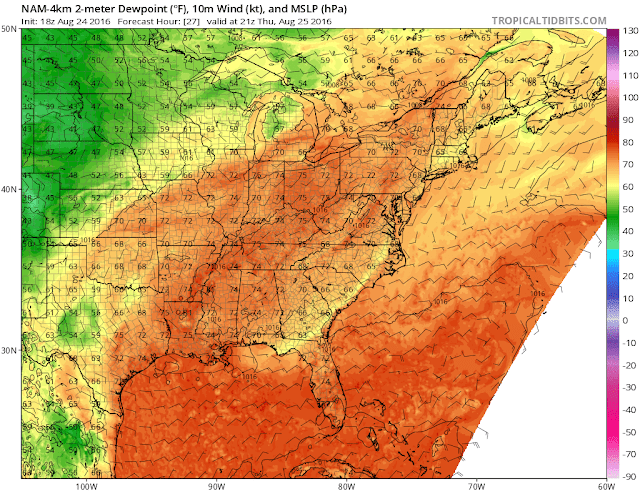 By the weekend dew points drop as well as temperatures. Expect low 80's with dew points in the upper 50's on Saturday with sunny skies. Repeat for sunny although a few stray clouds may pop up. Tropical Storm Gaston is experiencing some wind shear so it has yet to become a Hurricane. I thought it would have by now but it looks like it will have to wait a few days. First here is the Atlantic surface map. Now here is an infrared satellite image with the current major players. Now the same image with the water vapor satellite. Notice the counter clockwise flow around the upper low heading right into Gaston's path. This is wind shear. The upper level winds are strong enough to displace the thunderstorms around Gaston to the east of the center. In order for a hurricane to be strong the thunderstorms need to be over the top of the center. Never the less the only impact from Gaston will be strong waves if it can get its act together in a few days because he will track out to sea. Part of that shear looks to be impacting the disturbance near Puerto Rico called 99 L which just means it is a wave or tropical low to be watched. This is the low that will have a chance to develop into a tropical storm once it clears Hispaniola. Of course the wave has to survive the trek near the mountainous island (home of Haiti and the Dominican Republic). Given that a low level center has not formed yet I think it will. So the 120 hour forecast shows a cone like this. By Saturday at 2 PM I expect a storm to be gaining strength in the Bahama's sort of like the recent North American Model run shows. That's about all the actual surface forecasts I will commit to at this point. But now I think the storm does go into South Florida as a strong Tropical Storm or a weak Hurricane. I'm hesitant to post what I'm about to say so I will toss about a disclaimer. I am NOT FORECASTING HURRICANE KATRINA. However it does remind me of Katrina's first landfall in South Florida as a Category 1 Hurricane. People forget that Katrina hit near Miami first before it became the monster it did in the Gulf of Mexico. The track and intensity looks similar to the first part of Katrina, not the second. Now for the next part of the storm I think it is shifted into the Gulf of Mexico. High pressure will be in control near the Mid Atlantic coast which will force the storm west. After that a trough will move through the Central US leaving a piece behind to capture whatever tropical system is there. It will be pulled north into the US Gulf Coast. I can't speculate on strength yet so I won't. Then by the end of next week the moisture from the system may end up in the Northeast but that's a ways away. South Central Florida begins to feel the burnt of the storm Sunday afternoon through Monday. The Central Gulf Coast will be feel impacts Tuesday and Wednesday if it is able to emerge into the Gulf and not stay over land in Florida. This is all assuming it forms and doesn't get ripped apart in the Caribbean. High pressure will remain in control tonight and tomorrow before pushing offshore on Thursday as a weak cold front approaches. With that cold front comes a chance of showers and thunderstorms especially Friday PM. Tomorrow will be warmer than today and Thursday will feature a return of the humidity. 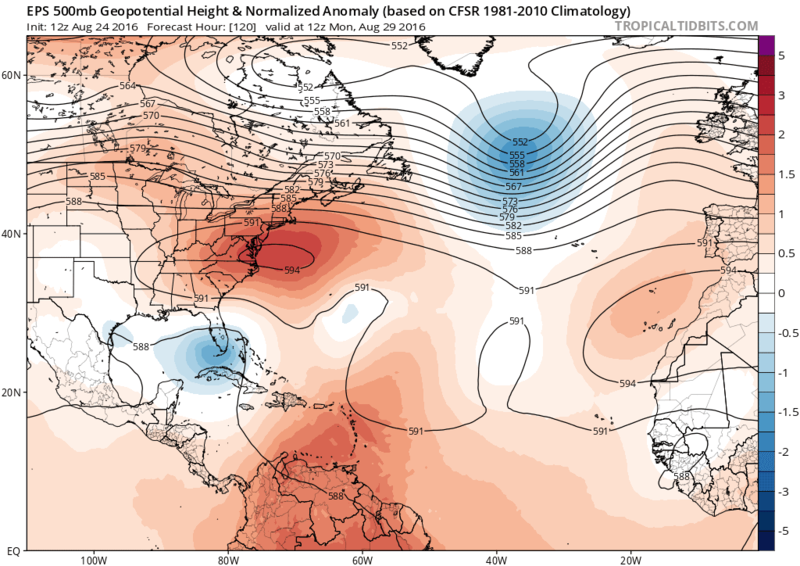 Given that it is late August my eyes continue to be focused on tropical weather in the Atlantic. No doubt about it today was one of the top days of the year. Low humidity, bright sunshine and max temps in the low 80's made for a comfortable day and a great afternoon to be outside. So who is to blame for such wonderful weather? High pressure centered over the Mid Atlantic is. The source region for our air mass in a configuration like this is Southern Canada. Tonight that high will begin to slide offshore a bit. Our winds will remain out of the west tonight and tomorrow before taking on a southwest component tomorrow night (they were out of the northwest yesterday and last night). 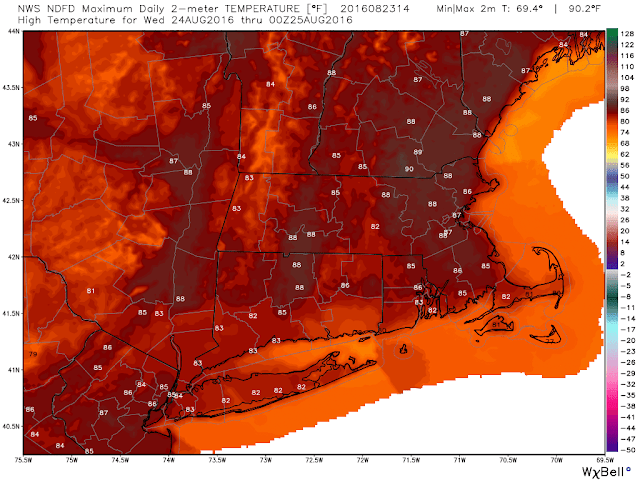 That slight offshore shift of the high will allow for max temps in the mid to upper 80's tomorrow. Not back to school or fall sports yet and thinking of heading to the beach? Get up and get gone. 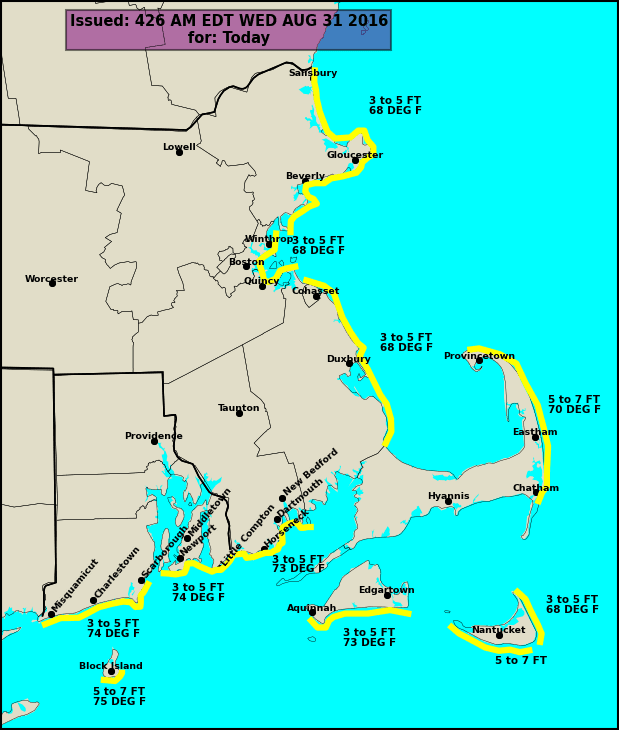 Surf zone forecast looks great for all Southern New England beaches with low rip current risk. By tomorrow evening look at the high pressure moving offshore. The resulting southwest flow leads to a return of dew points in the 60's on Thursday. There should be a few more clouds on Thursday so temperatures max around 85. Friday we watch the approach of the cold front and the chance of afternoon showers and thunderstorms. I don't think we see anything like Sunday night/Monday morning. For those who were sleeping *pun intended* a EF-1 tornado with 100 mph winds tore through Concord around 345 AM Monday. Here is some damage. This became the first tornado since June 23, 2015 to hit Massachusetts when a pair of weak twisters impacted Westminster and Wrentham. 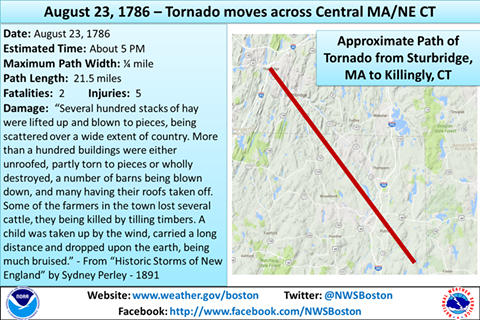 Some 230 years ago a tornado hit Sturbridge on this date proving that late summer is still tornado season in Southern New England. The tropics remain active. Gaston (far right) is nearing Hurricane strength while the middle disturbance continues to slowly organize. Gaston is on its way to be a powerful open ocean "fish" storm. 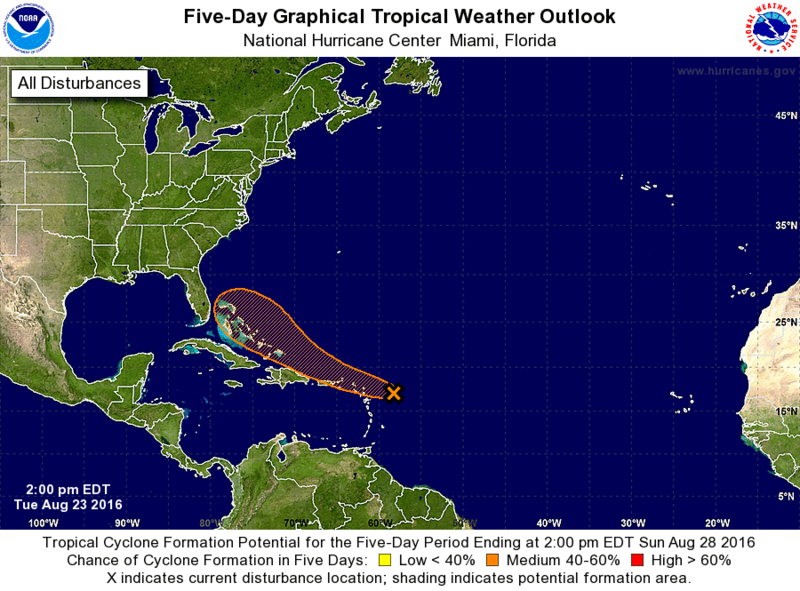 In five days the middle system should end up near the Bahama's. Where it goes from there is a good question. How strong it gets is also a good question. As I stated yesterday I believe the storm organizes enough to become named Hermine and it could possibly become a hurricane in the warm water near the Bahama's. Then will it turn into Florida and the Gulf of Mexico or will it carry north towards the northeast? Or does it weakly carry out to sea? I think a track towards Florida and the Eastern Gulf of Mexico before moving north is most likely because of an upper ridge in the Southeast. This chart shows a decent probability of a ridge near the SE coast in a week. Now where this sets up exactly will determine the eventual track of this disturbance. No need to panic I'll keep an eye on it. We have time! Five years ago today I was tracking a Hurricane in the Bahama's by the name of Irene. The calendar reads August 22 and right on time the Atlantic Hurricane season has sprung to life. Tropical Storm Fiona has weakened to a tropical depression but a new tropical depression has formed near the Cabo Verde Islands in the Eastern Atlantic. Tropical Depression Seven will become Tropical Storm Gaston and then become a Hurricane (and probably a major hurricane) but it should steer clear of land for a long time. Way down the road, say 10-12 days it may make a turn east of Bermuda before approaching Newfoundland but this is a long way off. We will have to watch the surf for Labor Day weekend at any rate. This happens most years because August 20- October 20 is the peak of every season with September 10 as the peak of the peak. Now historically speaking here are the tracks storms typically take in August and September. 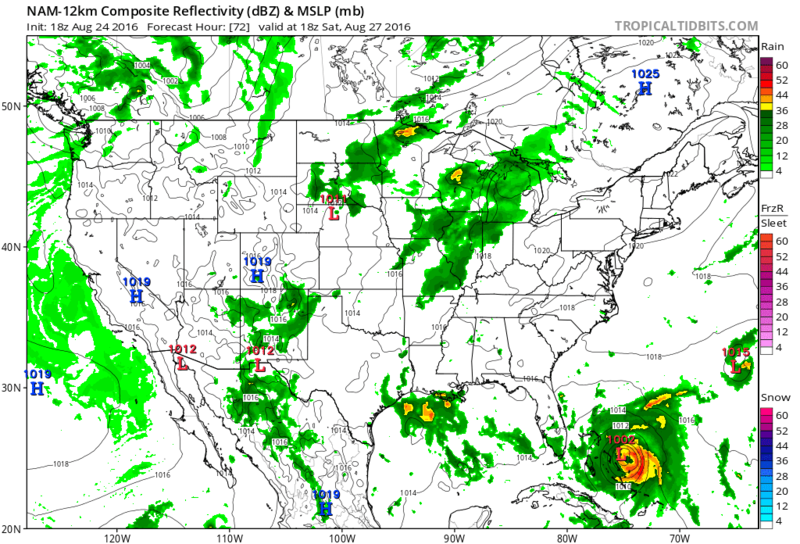 I post all of this because the other X in the active tropical cyclone image at the top of the page is forecast to move towards the Bahama's by Saturday. Any time a tropical cyclone gets near the Bahama's it has a chance to impact the United States, including New England. Here is the forecast. Will the storm definitely develop? No it might not. The American GFS model doesn't really develop the wave. The EURO model does and it drive a powerful storm into the Gulf of Mexico. Both solutions are on the table. I personally believe the lead wave will form and it will get the name Hermine (they should just change that name to Hermoine and get it over with). Atlantic sea surface temperatures are very warm in the Southwest part of the basin and into the Gulf of Mexico. Any time a tropical cyclone gets into the Bahama's people in New England have to pay attention. Its where our last hurricane was born. 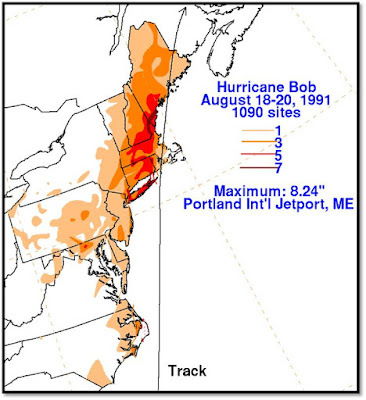 Bob first formed on August 15, 1991 near the Bahama's from the remnants of a cold front that pushed off the east coast. Here are the four panel reanalysis charts at various levels of the atmosphere. Please look at the top right image. It shows an upper level high pressure system (ridge) in the NW Atlantic and a upper level low (trough) diving east in the Upper Midwest. Those factors led Bob to move north instead of west or east. By Monday August 19 Bob was a strong Category 2 Hurricane with winds of 105 MPH racing towards Block Island and Buzzards Bay. The reanalysis shows why the storm continued north instead of missing out to sea. It was blocked by that upper ridge. That afternoon Bob made landfall in Block Island and then in Newport. 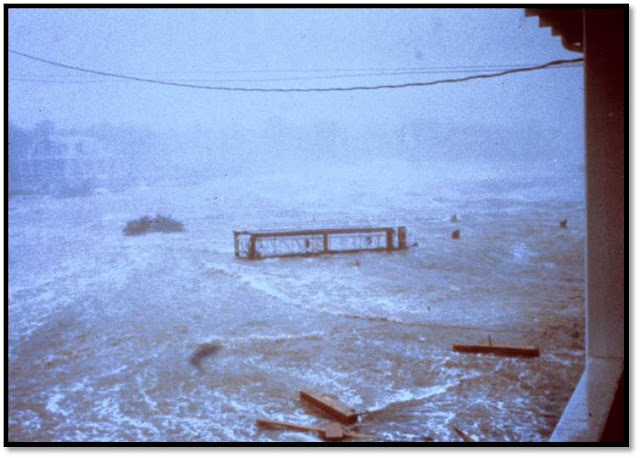 He drove a 10-15 foot storm surge up into Buzzard's Bay and winds reached 130 MPH in Truro, MA. Over 2 millions people lost power and 17 people lost their lives. Over $1 Billion in damage was recorded. 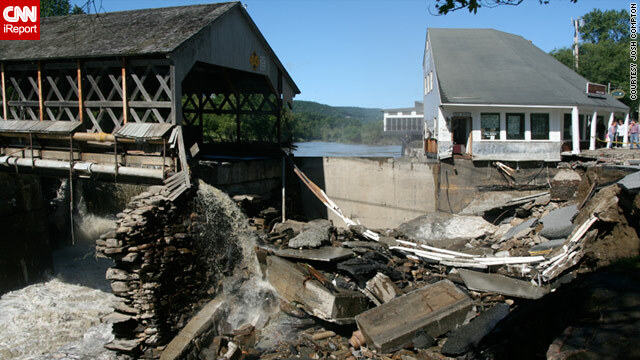 If you remember my post about Connie and Diane the damage was caused by river flooding. In Bob the damage was from wind and water, but not rainfall. Coastal communities bore the brunt of the storm, with sustained winds between 75 to 100 mph. Peak wind gusts to 125 mph were recorded on Cape Cod in the towns of Brewster and North Truro, as well as in Wethersfield, Connecticut. The highest sustained wind of 100 mph, was recorded in North Truro. Block Island reported sustained winds of 90 mph, with gusts in excess of 105 mph (maximum speed of equipment). Wind gusts to near 100 mph were recorded in Newport and by the Navy Ship Samuel B. Roberts, which was riding out the storm on the east passage between Newport and Jamestown, Rhode Island. Additionally, there were four reports of tornadoes as Bob came ashore. The lowest barometric pressure was recorded by the USS Valdez while in the east passage of Narragansett Bay, with a reading of 28.47 inches. Hurricane Bob caused a storm surge of 5 to 8 feet along the Rhode Island shore, but drove a surge of 10 to 15 feet into Buzzards Bay. 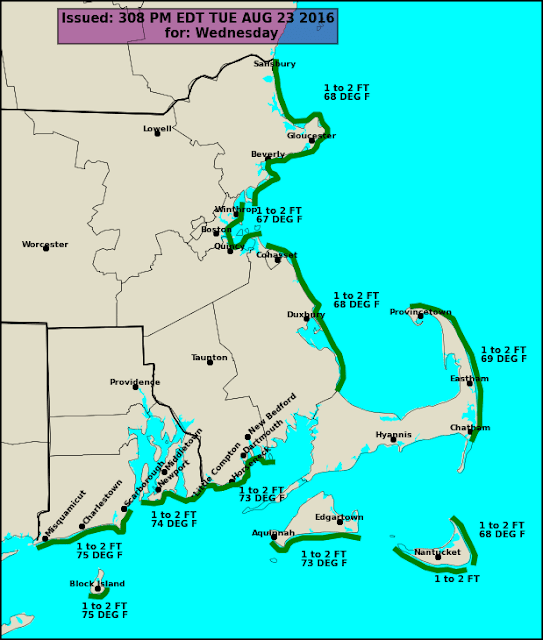 The Buzzards Bay shore east to Cape Cod was hardest hit. The highest surges, of 12 to 15 feet, were observed in Onset, Bourne, Mashpee and Wareham, at the head of Buzzard's Bay. 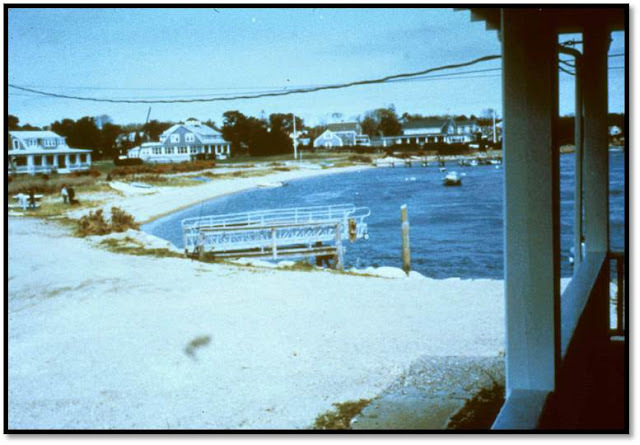 Cove Road, in Mattapoisett, Massachusetts had 29 of 37 homes destroyed, while Angelica Point, Massachusetts lost 32 of 35 homes along the shore. Boat damage was significant, as many boats were torn from their moorings. 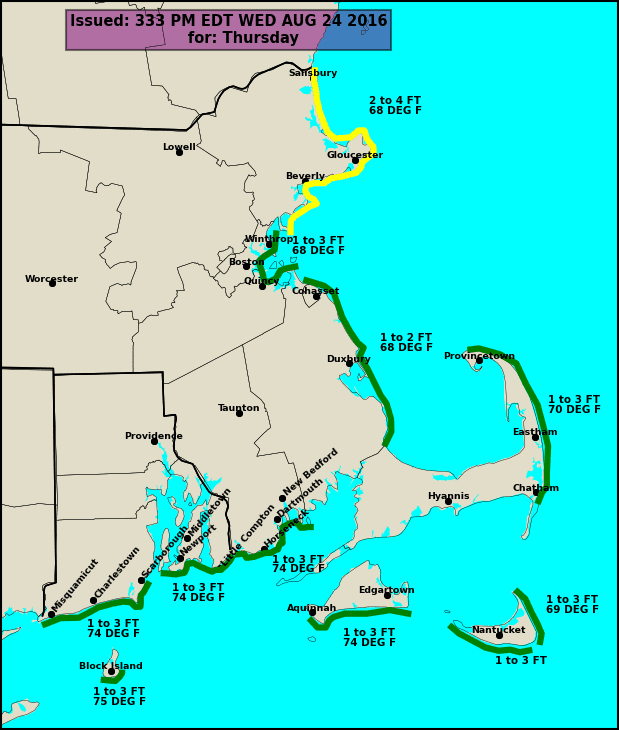 Extensive beach erosion occurred along the shore from Westerly, Rhode Island eastward. Some south facing beach locations on Martha's Vineyard and Nantucket islands lost up to 50 feet of beach to erosion. 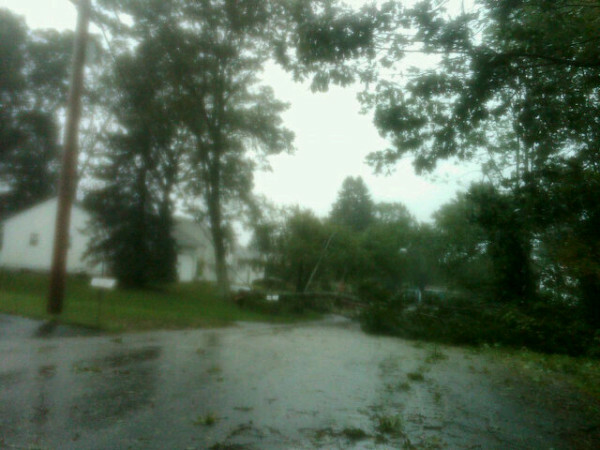 The storm was really bad in SE coastal New England. 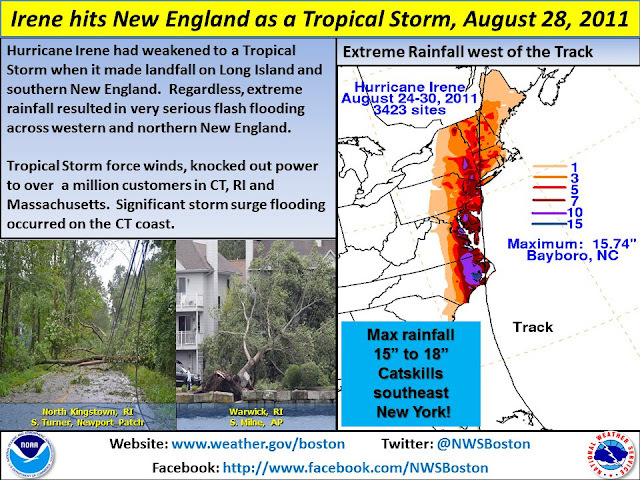 So now we have recapped 2 different years both with devastating effects in Southern New England for different reasons. 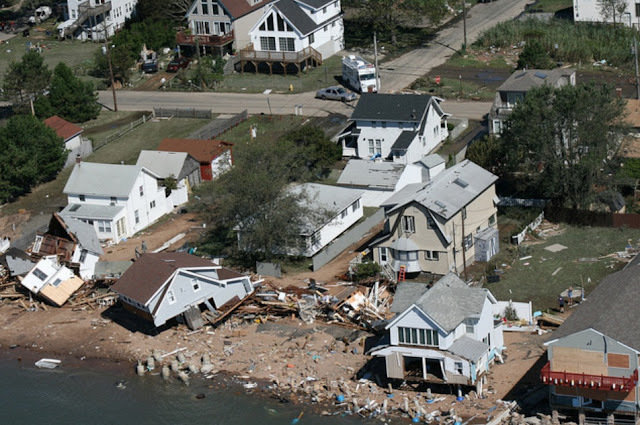 Hurricanes have a variety of hazards from coastal flooding to inland flooding to wind damage and tornadoes. The next post will look at some of the stronger Hurricanes in the Southern New England record.